Throughout my travels I have discovered that it isn’t just people that have souls anymore…places do too. The various countries, cities, villages and towns that I have encountered these past couple of years have their own character; their own voice and I have truly enjoyed meeting each and every one of them. However, there are certain places in which a connection is instantaneously made…just as there is with the various people that come in and out of our lives. Some we only remember on occasion, a memory triggered by a casual conversation or revisiting certain places; however, others we think of daily and we have a strong desire to keep them close as long as we can. 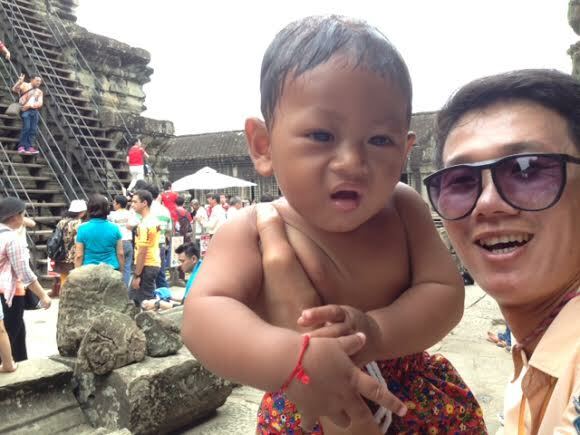 I have met a soul mate in Siem Reap, Cambodia and my experience there has been one of the most amazing experiences of my life. I will not be able to articulate my feelings or my experience in perfect detail so bear with me as I fumble my way through. Some might say, “Yes, Angkor Wat is beautiful, isn’t it?” But in all honesty, it wasn’t the magnificence and grandeur of this UNESCO site that stole my heart. It was the people. For a country still raw with its too recent history of war, genocide, bloodshed and chaos, the people are the warmest, kindest, most hospitable people you will ever meet. They live a simple life albeit one of corruption and poverty, hard work and adversity, yet their smiles are the friendliest, most sincere I have ever seen. 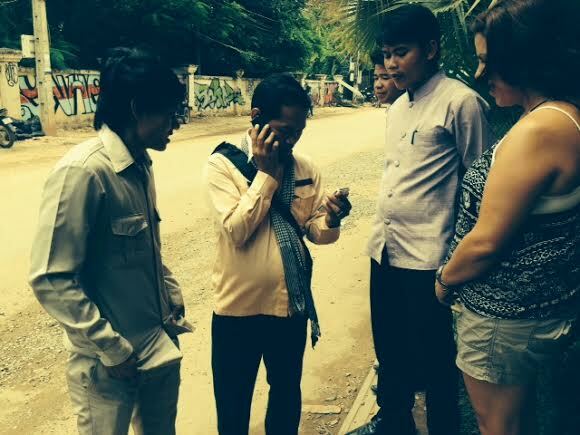 I loved everyone I met…even the Khmer ladies running their shops relentlessly asking me to buy their goods. “You buy from me pretty lady. What you like? We have something for you. What color you like? You buy from me and I give you special price only for yoooouuuuu.” Despite the continuous rant, I never actually felt a lot of pressure to buy; no one physically pulling me into their shop as I have experienced in other places. After a while it was pretty easy to ignore and I actually welcomed the constant stream of various voices as Mom and I shopped our way through the streets and markets. 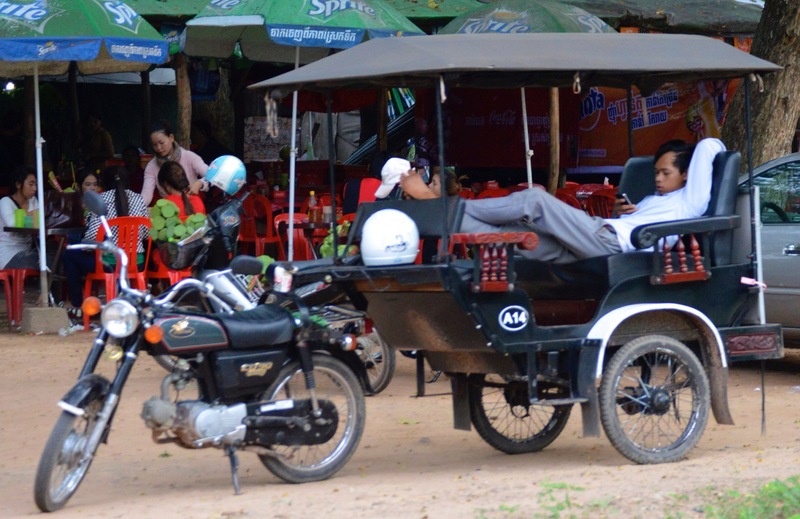 He was our tuk-tuk driver during our stay in Siem Reap and my absolute favorite person I met on this adventure. My apologies for the faceless picture as this, regrettably, is all I took despite the lasting impression he left on me. He has the warmest eyes and the most genuine smile with a just a hint of shyness to it. Each morning he greeted us with a “hello” that seemed to really say “it’s good to see you again.” Maybe it was the generous tips I gave him after each ride (shhhh, don’t tell Mom), but I think he was genuinely pleased to see us just as we were to see him. One morning I woke extra early to venture through one of the temples on my own before the crowds and the heat arrived. When I stepped out of the hotel, Son was already waiting for me and greeted me with his sweet smile. It was an overcast morning and a gentle rain fell as we cruised through town and then into the forested area of the ruins. 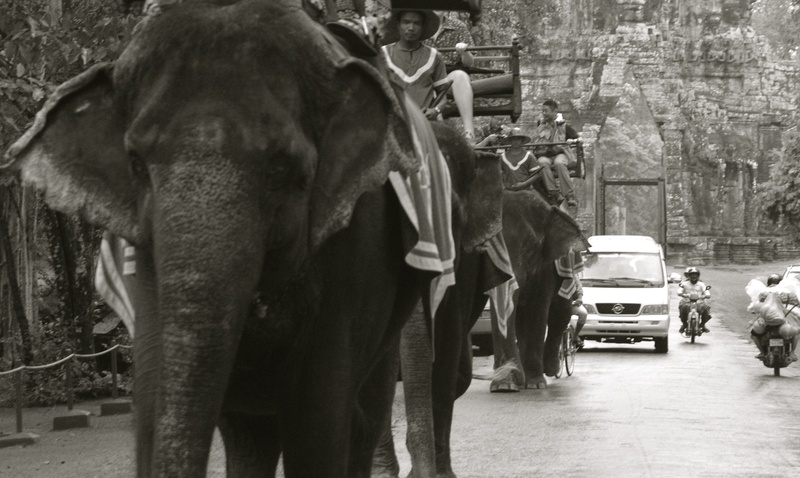 As early as it was, the streets were already bustling with the daily activities of its inhabitants and I watched it all from the carriage of the tuk-tuk knowing I was in safe hands with Son at the wheel. We parked just outside the temple I was visiting that morning. Son told me he’d be there waiting for me when I returned. I told him I’d be a couple of hours and he gave an all-knowing nod as if he already knew this was a special place that would need time to explore. I took my time wandering through, mesmerized and in awe of the magnificence of it all and relishing in the quiet as only a few other visitors had arrived at that point. When the crowds started to arrive it was my cue to head back. I’d had my time and slightly regretted not waking just a bit earlier to have more of it to myself. Oh we’ll, I can’t be too greedy. I found my way back to where Son had dropped me off. Quickly scanning the area, a slight worry crept in as I didn’t see him straight away. Several tuk-tuk drivers called to me and I just shook my head knowing that I would find Son soon enough. Gone was the quiet, empty open area I knew from arrival and in its place was the hustle and bustle of locals and tourists milling about; shopping, selling fruits and other goods. Luckily, it didn’t take too long to spot him. He sat tucked away in the shade, sitting in the carriage of his tuk-tuk with his bare feet propped up and his arms lazily crossed across his chest. He hadn’t seen me yet and in that moment I paused and simply watched him. A gentle smile was penciled on his face. His gaze was towards the temple, but I could tell he wasn’t really looking at it; just lost in his own thoughts. Maybe he was thinking of how amazing the morning weather was as the heat and humidity had not crept in just yet or maybe he was thinking of the pretty girl he had his eye on and how he planned to get her attention the next time they met. Whatever it was, he was at peace and it warmed my heart to see him that way. The moment didn’t last long as he noticed me standing there and quickly slipped his feet back in his shoes and jumped out of the carriage. 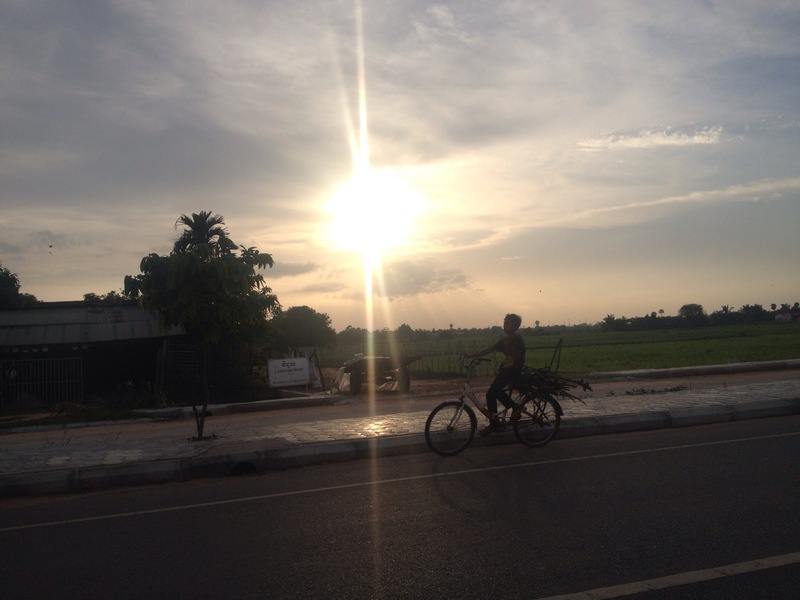 I wanted nothing more than to just join him that way…to sit with him in that peaceful state in the back of his tuk-tuk and talk casually about what had been on his mind when I so rudely interrupted him. I also wish I had snapped a picture as I don’t feel my words can adequately describe the moment, but as it is, I didn’t. The picture is in my mind and will be with me always. I don’t know anything about Son’s life, but can presume that it can’t be too easy on a daily basis, but whatever was on his mind, he was able to leave the harshness of the real world behind him…. even if for just a moment. 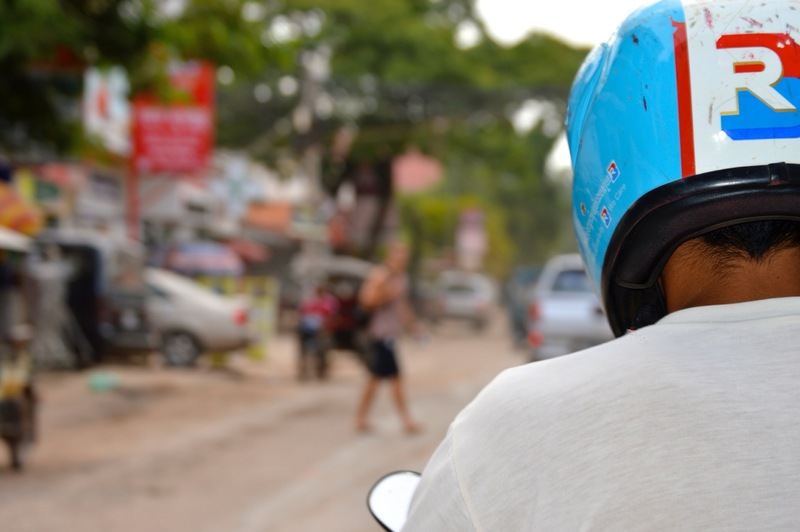 In the short time we were in Siem Reap, we learned of several NGO organizations that are working hard to empower the people of Cambodia. One of these was the Phare Circus. This organization trains young kids and provides them with skills and jobs. Not only is this a fantastic organization, but the show was amazing! Mom and I were on pins and needles as these youngsters performed some incredible acrobatic feats. I can’t recommend this enough (check out www.pharecambodiancircus.org to learn more!). I also had a wonderful time spending money at Claycult Beads. 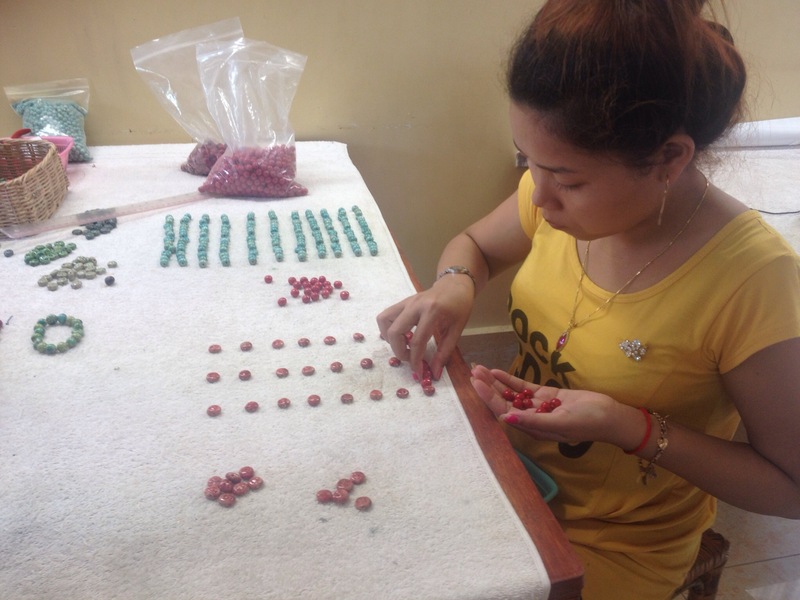 This organization provides jobs for many Cambodian women as they do every step of the process, literally every step. And the beads…oh my…absolutely beautiful! The young guy helping us actually had to take me to an ATM…on his scooter (you’ve seen my video of the traffic, right?)! The owner/founder is Australian and will have some of the beadwork up on etsy soon. 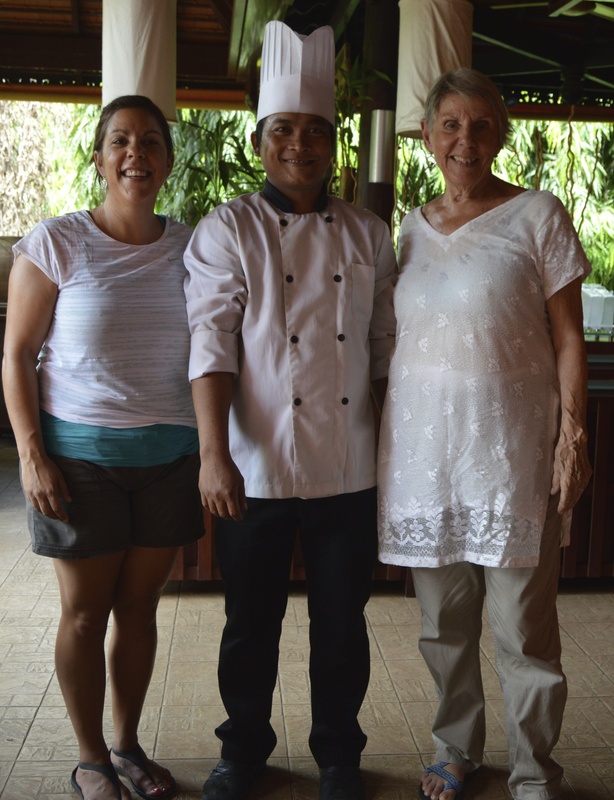 From the hotel staff to the children on the street, Cambodians are innately hospitable and kind people. I fell in love with almost every person I met and will remember them always. How many Cambodians does it take to find the bead shop? Our guide…he didn’t talk much, but sure was a cutie! The entire park is quite massive (about 400 square kilomteres) and the various temples range from 600 to 1300 years old. They are the remains of the different capitols of the Khmer Empire and the area was the center of the Khmer kingdom for several centuries. Mom and I really only had two days to explore the park, but I think you could spend a couple of weeks and still not see it all. We even read that they are still uncovering historic sites and will for years to come. The main temple, Angkor Wat, is massive and was built to honor the Hindu God, Vishnu…although you can see evidence of changes that were made to make it a Buddhist temple somewhere in the 14th or 15th century. A moat and an exterior wall surround its impressive entrance and its walls are covered with various reliefs and carvings that all have some meaning. Although this wasn’t my favorite temple, it was definitely the most popular and the luxuries that it once provided are still very evident. Everyone has heard of Tomb Raider. I am not ashamed to admit that I have not seen the movie…although I might now just because of visiting Ta Prohm where it was filmed. 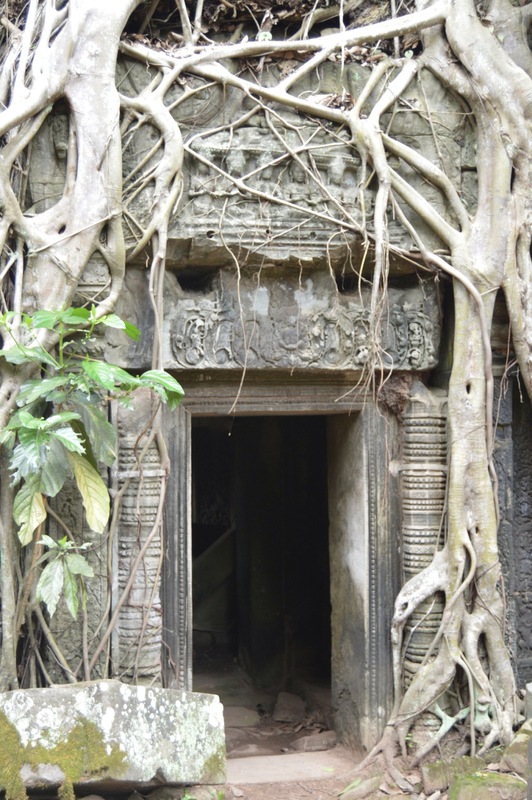 This temple is actually in shambles because of the species of trees that inhabit the area. Although it makes for an awesome atmosphere with the trees growing out of the temple itself, the conservation of the temple is a controversial one as these trees are actually destroying the temple. This site was incredibly beautiful and I actually liked that it was left in the same condition in which it was found. Of course, this temple and all of Angkor Wat became much more popular after the movie. 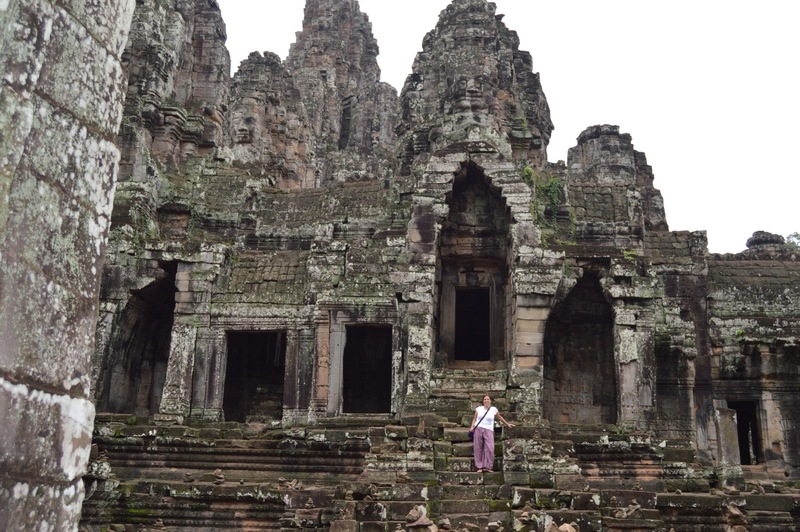 My favorite was Bayon Temple. It was built as a Buddhist temple around 1200AD. This temple is supposed to represent the intersection of heaven and earth. There are 54 towers thought to represent the 54 days of the lunar calendar and each tower has four faces that symbolize the four states of Buddhism; charity, compassion, sympathy and equanimity. This was the temple in which I explored on my own. Its architecture has a sense of mystery, power and tranquility all blended together. I loved it. Cambodia definitely left its mark on my heart. I can’t wait to go back…and maybe someday I will call it my home away from home.